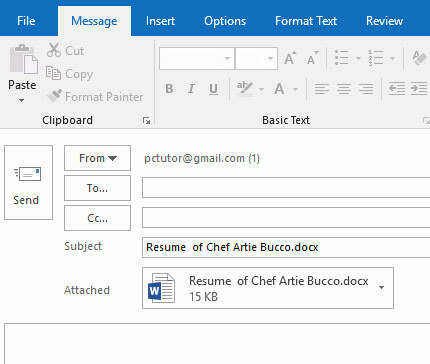 Did you know you can create a document in Microsoft Word and send it from Outlook as an attachment, and you never even need to click to open Outlook? It’s true, and it’s pretty easy. And why would you want to do this? The main reason is simple: fewer clicks. This makes it faster and easier than the traditional way of attaching a file to an email. Normally, you would create the email in Outlook, then tell Outlook you want to attach a file, then navigate to that file and choose it. None of that is necessary, since you’ll be doing the entire thing without even directly opening Outlook. 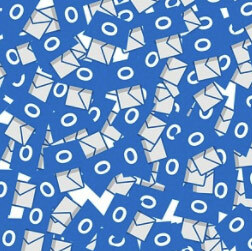 The other reason is that it prevents you from attaching the wrong document to the email. In some cases it can be a bit embarrassing to send an email with an attachment and then find out that you sent the wrong file. Or the situation that happens to all of us at some point – you sent an email that says the file is attached, but you end up forgetting to attach it completely. I’ve definitely done that more than once. This process eliminates all those errors. 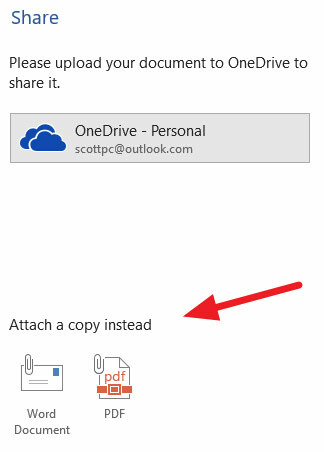 That’s because you do everything inside MS Word, right in the very document you want to attach. 1. Open MS Word and create a document, and save it. The document should still be open there on your screen after you have saved it. 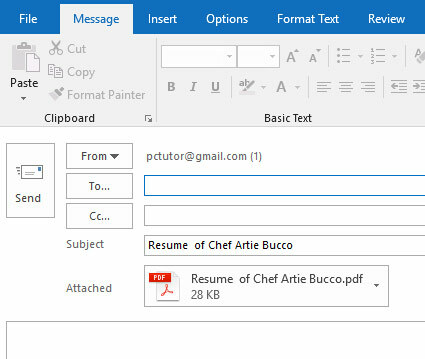 For this example we’ll call the document “Resume of Chef Artie Bucco.docx”. If you click on Word document, here’s what happens immediately. A new MS Outlook email opens. The subject line for this new email is the name of the document (you can change it if you want). And your Word document is already attached. And incidentally, you can use this same process to attach other MS Office files to an Outlook email – Excel spreadsheets, Powerpoint presentations, etc. I have been receiving your podcasts for over a year and most of them are good information that I can use and apply to my work environement; but this one just saved me a ton of time!!! Thank you! I had no idea about this trick and that I can use it in Excel is wonderful. I have to email a pdf of an Excel spreadsheet to a client every morning and this is a perfect way to do it faster! The steps and keystrokes it’s going to save me…. !! Yeah! This is a very useful tool, you can also do it in one click. Add “E-mail as PDF attachment” or “E-mail as XPS Attachment” on the Quick Access Toolbar. One click and you have an open email with attachment. Artie Bucco, a blast from the past lol! I was wondering if anyone would notice or catch that!